Dog tricks can be a lot of fun to teach your dog. Any dog can learn some tricks, whether he's just a puppy or he's an older dog. There are lots of different ways to teach tricks, too. You can have fun with your dog and entertain your family and friends at the same time. Most tricks are fairly simple to teach. 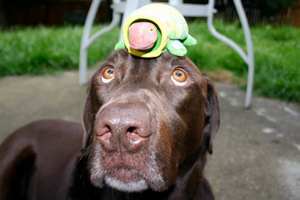 You can often teach your dog a trick while you are sitting in your living room watching TV. Some advanced dog tricks require more concentration and focus so you may need to be in a room where you and your dog can be alone. For some tricks your dog may need to wear a collar or a collar and leash. A flat buckle nylon collar is usually a good choice. This is the kind of collar most trainers suggest for training your dog. You will also probably need a good supply of treats. Most people teach their dog tricks by using treats as rewards. You can use any kind of treats your dog likes. It's a good idea to use treats that are tasty but small. You may need to repeat a trick multiple times when you're practicing it, so you don't want your dog to fill up on the treats too fast. Each trick is different and you will need to follow the directions for teaching your dog. Or you may notice an easier way to teach your dog. That's fine. You might make a good trainer! One good idea when training your dog is to keep things fun. Dogs learn best when the training is fun for them. So keep the training cheerful and positive. If you are having a good time then your dog will think the whole exercise is fun. Don't try to teach your dog anything if you are down or depressed. You should especially avoid any kind of dog training if you are angry. Your dog can read your emotions and always knows how you're feeling, so save training for a time when you are feeling good. Try to train 10-15 minutes two or three times per day. Dogs learn best in short sessions. They do not learn well during long, marathon training lessons. Keep the training short and teach what you want your dog to learn. Then end on a high note with lots of praise and treats. Your dog will remember what a great time it was and look forward to the next session. It is easier to teach many tricks if your dog already knows some basics. Start with basic dog obedience training commands such as Sit, Come, Lie Down, and Stay before you start teaching him tricks. These are basic commands. If your dog knows these commands he already knows the basis for half a dozen tricks. Start with a few easy dog tricks like "fetch," "shake" or "kisses," before moving on to more complicated tricks that require multiple training steps. There are lots of different training methods. Use what works for you and your dog. Many people like to use clicker dog training. Clicker training is a positive dog training method that combines positive reinforcement with operant conditioning and then adds a marker, which is the click. When your dog does something you want them to do, you click the clicker and give them a treat. The click "marks" the desired behavior so the dog can remember it. But you can use any training method that succeeds for you and your dog. Some people like to use a treat as a lure to get the dog in the right position for a trick, then reward them with the treat. You can also use a combination of methods if that works best. Be flexible and creative with your training. You don't have to worry about pleasing anyone else. It's just for you and your dog. Teaching your dog to do tricks can be a lot of fun for you and your dog. Teaching your dog some basic dog obedience commands is often a good way to start. Plus, the commands can form the basis for a lot of tricks. Stay positive and cheerful when you train and your dog will enjoy training more. Teaching your dog tricks should be fun. Use the methods that work best for you and your dog.